Our heroes infiltrate Rivergard Keep via a captured boat. Their ambush quickly turns into a giant battle with the Keep’s forces. We had brought our characters from our first adventure, “The Lost Mine of Phandelver” over to “Princes of the Apocalypse.” This meant that my players were slightly over leveled for the beginning of this adventure. They hit level 5 soon after reaching Red Larch. Even skipping most of the newbie content, my players were over-leveled for the beginning of the main campaign (which is designed for level 3 heroes). Our heroes defeat a group of pirates at Womford and travel up the Dessarin River toward Rivergard Keep. Sometimes you have to scrap ideas even before they really start. If you’re DMing a game of your own creation you have to play the role of both designer and editor. You create the content, then constantly modify and tweak as your players mess with it. By utilizing a pre-published adventure, the bulk of the design is already done for me. I primarily do the editing work, which leads to a lot of customization and changes based on what I and my players like to do in a tabletop game. Returning to the ground floor of the Sacred Stone Monastery our heroes meet a friendly lich, hordes of monk cultists, and the Abbess of Stone herself. The unexpected can make for some supremely fun and memorable moments in tabletop role-playing. It’s a two-way street. Players often do things that will take me completely by surprise, and part of the DM’s skillbook is how to react to that. Sometimes though, I can throw a fun monkey wrench at my players and watch events unfold exactly as planned – like Renwick the friendly lich. This week my players had finished mopping up the Sacred Stone Monastery basement, and were intrigued about a well guarded door in the crypt. Having fought the zombie guards and survived the Cloudkill glyph, they prepared for a tough battle. They opened the door and were surprised to find stairs that lead back up to the monastery. Due to connection woes, we’re going to stop live streaming and just record our D&D sessions. Uploads to YouTube on Monday! Lately my ability to stream has gone down the toilet. My internet connection has never been great, but it’s always been good enough. In the last few weeks, however, I can’t live stream without dropping about 80% of the frames. Anyone that’s tried to drop into our Sunday evening live streams have noticed how unwatchable that is. My upload speed remains the same and I’m unsure what the specific culprit is, but it’s not going away. Since it also records and uploads to YouTube, it’s starting to drag the quality of our recorded videos down as well. The solution is to just stop live streaming altogether. Instead I will record our sessions on Sunday evening, and upload them on Monday. The majority of our viewership and audience interaction comes from these archived YouTube videos anyway, and now the quality should vastly improve. We really appreciate all the views and comments on our adventures and here on my blog. 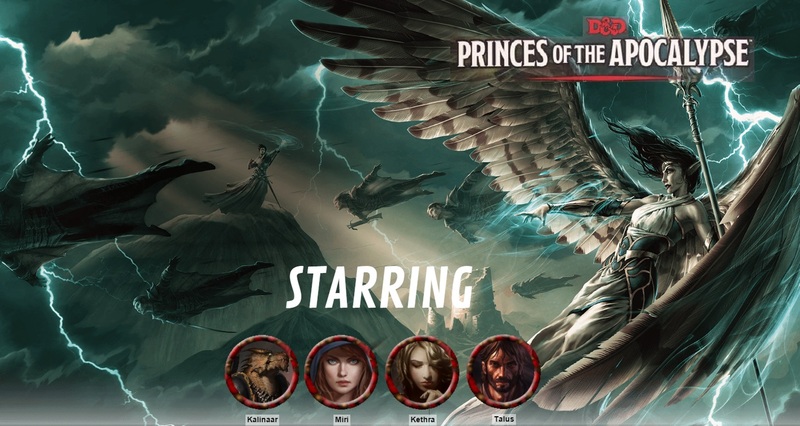 “Princes of the Apocalypse” is well under way and should last us throughout the year. If my connection woes ever improve we can try live streaming again, but for now you can watch our weekly adventures on my YouTube channel, and read about them here on my bog every Monday.